Bullets don't expand in the first place, as in blowing up a balloon. They shorten and deform upon impact. Expansion may well be a more effective marketing term than shorten and deform, but shorten and deform is more representative. The cartridge that drove the American Bison and the grizzly bear to extinction, the .45-70 Government, hardly relied on expansion. The standard load was a 405 grain bullet at 1305 fps muzzle velocity. It's .458 diameter bullet didn't need to expand, as large bullets don't shrink in diameter. The .243 Winchester is a good example. Originally designed as a varmint round, it was introduced in 1955. A recovered .243 that has expanded to 180% of its original diameter sounds wondrous. Yet, that equates to about .437 in., smaller than than our .45-70 Government with zero percent expansion. It isn't that deforming bullets are bad things, quite the opposite. Expansion is good, writes Dr. Martin Fackler, but never at the expense of adequate penetration. The notion of a deforming bullet in small to moderate calibers is a good one. Flatten the trajectory, allowing for easier shot placement, yet create a larger permanent cavity upon impact. It is hardly needed for deer in several cartridges. The reason the hard cast 300 grain bullet in a .44 RemMag has found favor is again because a .429 in. bullet doesn't shrink. A big hole is better than a smaller one and two holes are better than one. It was Jack O'Connor in the 1967 book, The Art of Hunting Big Game in North America, that noted the specific caliber is the least important of all and that the most important factor in killing power is the placement of the bullet." O'Connor further noted Eskimos kill caribou, sheep, and polar bears with .22 Hornets and .222s, and pioneer Canadians had no trouble acquiring moose with .25/35's and .30/30's. For this reason, the 20 gauge slug gun shooting sabots has obsoleted its 12 gauge counterpart. With trajectory essentially identical to the 12 gauge, the 20 gauge is inherently more accurate, better handling, and easier to shoot well. Federal Barnes load P209 XT1 is published at 1900 fps MV, with a static B.C. of 0.205. It is a .45 caliber 273 grain (5/8 oz.) slug, one that opens in soft tissue with essentially one hundred percent weight retention. Federal .44 RemMag rifle ballistics fair poorly by comparison, as Federal load C44 is a 240 grain hollow point, MV 1760 fps, with a static ballistic coefficient of .170. In terms of trajectory, bullet mass, bullet diameter, tissue disruption, impact velocity, penetration, etc. the 20 gauge slug load is superior in all respects. Yet, the .44 RemMag has long proven to be an effective whitetail and black bear round, out of a vented barrel handgun, much less the 20 inch test barrel used by Federal for the C44A load. 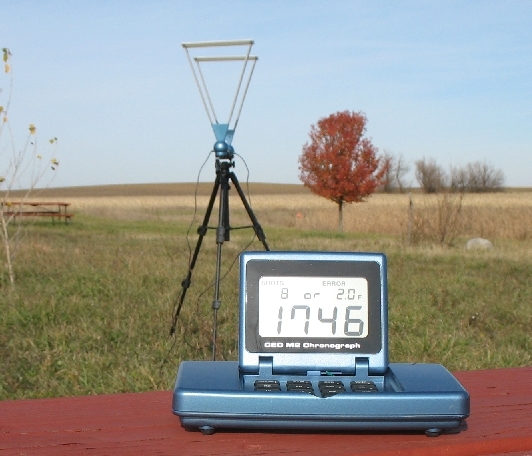 Rather than 1760 fps, this same load is 1230 fps MV out of a revolver as published by Federal. It shouldn't be any great surprise that a .45 caliber, 250 grain class projectile is an effective whitetail round. It has been obvious for over the last 25 years, as 100 grains by volume of Pyrodex RS moves a saboted 250 grain, .45 caliber projectile out of a .50 caliber Knight MK-85 right at 1700 fps. 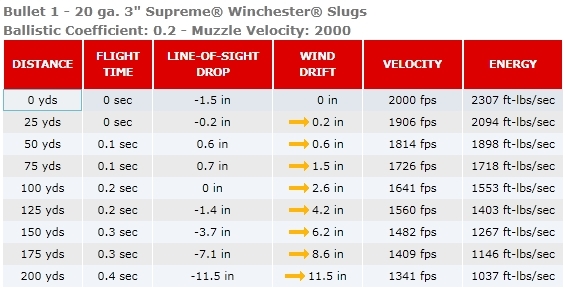 Right now, slug guns are finally at what is has been the lower end of inline muzzleloading trajectory performance since the mid-1980s. Above is a comparison of the .44 RemMag vs. the 20 gauge saboted slug from Olin-Winchester. While the Winchester data is bogus (it yields the same ballistics from a handgun and a rifle with a .44 RemMag), it still gives enough to compare a .44 RemMag out of a revolver to a 20 gauge Partition Gold slug. Factory slug ballistics are invariably wrong as well, as they use "standard 30 inch test barrels," though no common slug gun is available with a thirty inch barrel, nor is one desired. Above shows what you really get from a Federal Barnes Tipped Expander out of a Savage 220. No, it sure isn't the 1900 fps that Federal prints on the box, but you'll not get the 2000 fps Winchester prints on the boxes of their Partition Golds, either. Ammo factories uses "standard 30 inch test barrels," although your slug gun doesn't have a barrel that long, and no one wants them. Still, it is better than a .44 RemMag out of a rifle, with a better trajectory than the common 240 grain .429 in. HP, and very much along the lines of the 100 grains (volume) Pyrodex RS / Knight MK-85 level that has established a superb record on deer since the mid 1980s. Nevertheless, at 150 yards, where 95% or so of the deer harvest is made, nothing can live on the difference between a .30-30, a .243 Winchester, a .44 RemMag from a rifle, a .338 WinMag, or a saboted 20 gauge slug round assuming good shot placement. While bullet deformation in soft tissue is more critical with a .243 Winchester than in a .45-70 Government, as bullet weights and diameters increase, it becomes less and less important to the point of trivia. Shot placement and adequate penetration still reign supreme, just as they always have. ©1999 - 2011 Randy Wakeman. All Rights Reserved.